Check it out, two months into the year and I am actually keeping up with my goals. Woot woot! 😉 Today is also my momma’s birthday. She is an amazing woman and I love her to bits. This month was good in a lot of ways. Winter hasn’t been nearly as harsh as usual, thinking more positive is making a big difference in me, and I am checking off goals and adding new ones. Writing: I finished a short story which is now in the hands of my first round of beta readers. I am getting great feedback. The biggest thing for me is that my editing skills have improved a lot. Aside from some line edits, I don’t need to make any major changes. Now I am figuring out what to work on next: a fantasy novel I started a few years back, or finish a story I started last NaNoWriMo. The Book Pile: I am now on book four of the year! My goal is to read fifteen, which is very attainable. If and when I go beyond that, bonus! Although I did break my reading rule. Instead of reading books only out on my table, I have been switching things up. But hey, i am in the reading groove again, that’s all that matters. Other projects: I have been doing pretty good with keeping up on my pen pal letters. I have a couple to write, but they are newer. It feels good being more regular in my snail mail. I am hoping to make my own envelopes soon, or at least creating some mail art. I hope you have had a great month. How are your goals coming along? A few times now I have mentioned IGGPPC (International Geek Girl (or guy!) Penpal Club). One of my fellow Iggles and friends wrote this post, and I thought I would share. She explains it perfectly. The awesomeness that is IGGPPC | Midget Bites. So firstly, because I am freaking the hell out at this news, I have to mention the newest on J.R.Ward. My book review I posted the other day was one book in the Blackdagger Brotherhood series, which I am in love with. The one thing with the books growing, the story becoming more complex, is that you see ledd of the ‘originals.’ The vamps that made you fall in love with them. You still see them of coarse. One thing I loved about ‘Lover Unleashed’ was that I got to see the POV of Vishous, who is one of the originals. Anyway, seems like JR Ward misses them too. the good ol’ days. The fun times with lines such as “If you’re going to bloody up the human, please take him outside.” And things like cherry stems, Grey Goose, and the boys causing shenanigans. She’s announced a new series, which the brothers are back in the forefront, and the first book comes out this December. I can hardly contain myself. Mr. C is shaking his head at me. I love him but he just doesn’t get it. Here is the link to the WARDen’s Goodreads post, explaining it all. Goodreads | J.R. Ward’s Blog – The Black Dagger Legacy Series – February 10, 2015 09:21. In other news, I was super stoked to get a letter today from Rosa in Denmark! (I hope my letter reaches you soon, if it already hasn’t!) It’s been a slow mail month (incoming wise) since I owe so many people a letter. So I was very happy to find the pretty letter in my mail box! 🙂 I just making a post from my phone app this morning, but in good old classic Blackberry fashion, my app isn’t working. 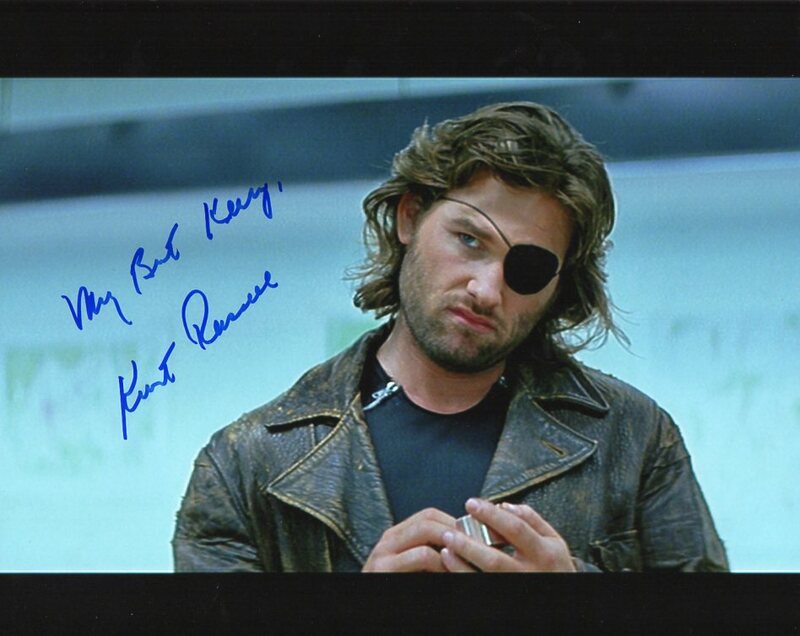 In a recent post I mentioned autographs I got through the mail, which sparked some conversation in the comments as well as out and about in my real life with some friends. 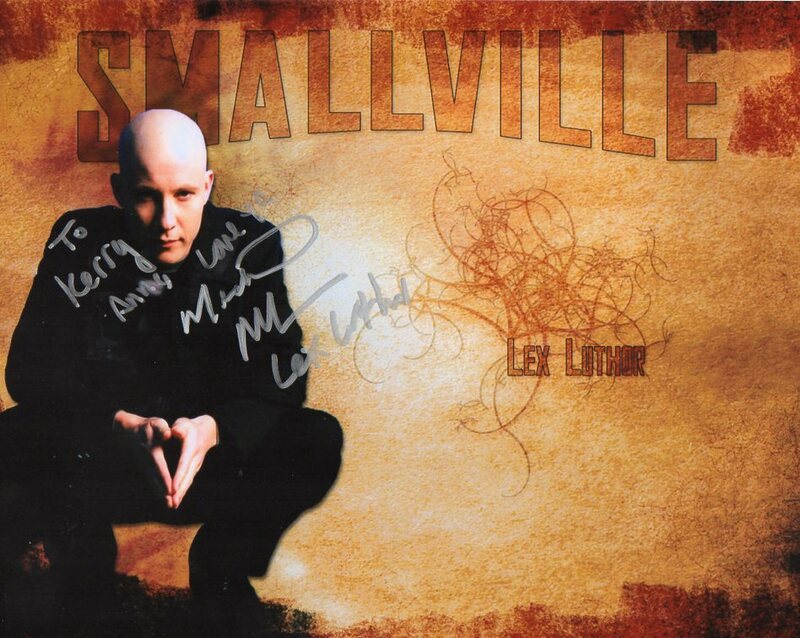 Micheal Rosenbaum. One of my first successes last year. There are three things I send each time I write to a celeb. The letter (duh! ), a SASE, and a photo. Here’s a few tips to up your chances at success! 1- The Letter. Make sure it is neatly hand written. Or type it. I tend to type mine, as sometimes (depending on my mood) my writing/printing is a tad sloppy. Plus, it is quicker for me to type. 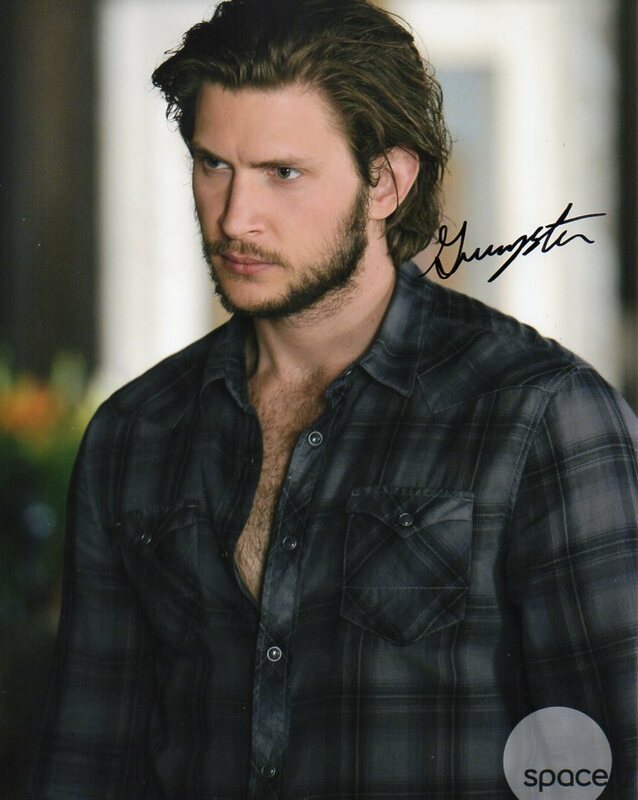 Greyston Holt from ‘Bitten’. On the back he wrote “Thanks for the lovely letter.” It is an added thrill and a bonus when they take an extra moment to write a little something. It is rare, but it happens. Caity Lotz from “Arrow”. On one feed back website, one guy had sent her actual cash for postage, and she returned it to him. Nice, huh? 3-The Photo. We usually get 8×10’s, and the odd time 4×6’s. For our fave actors, we get the large ones. Mr. C has also made us custom cards. Pic of person on one side, logo or whatnot on the other. We use Artscow.com for our photos. Cheap and most often great quality (The odd time an edge gets cut off.) You can also go to Walmart, Shoppers, or any other printing area, but Artscow has the best prices. ($1 for an 8×10, compared to $5 at Wal-Mart. And easier then us buying photo paper and loads of ink.) Of coarse, you can print off your own if that’s what you want. Some people send in DVD covers and the like. Jennifer Lawrence. I squeeeed the day this arrived!!! 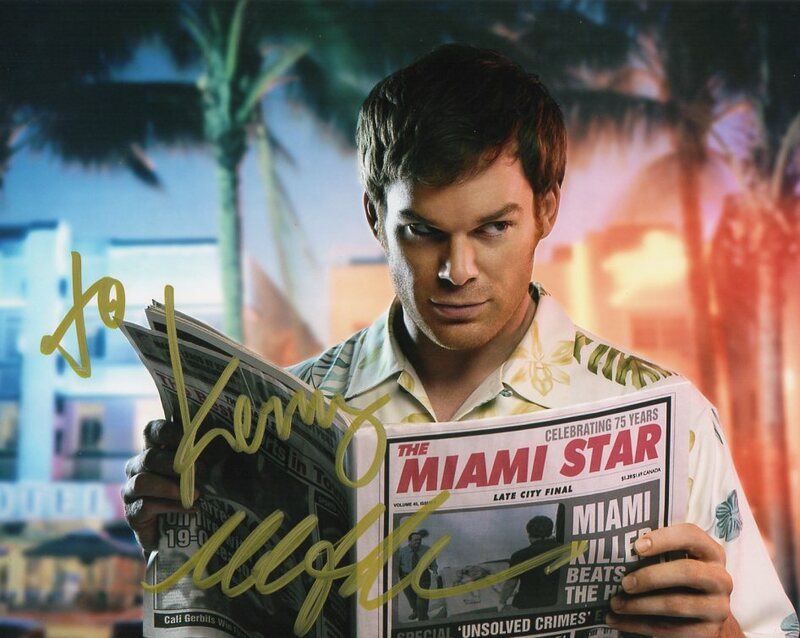 5- The Autograph. There is the odd time a celeb sends out a pre-print. Which means he/she signed a photo, had it copied a bunch of times, and sends it out. (Especially if they are super busy and don’t have the time to personally sign photos. But hey, you still got an autograph.) 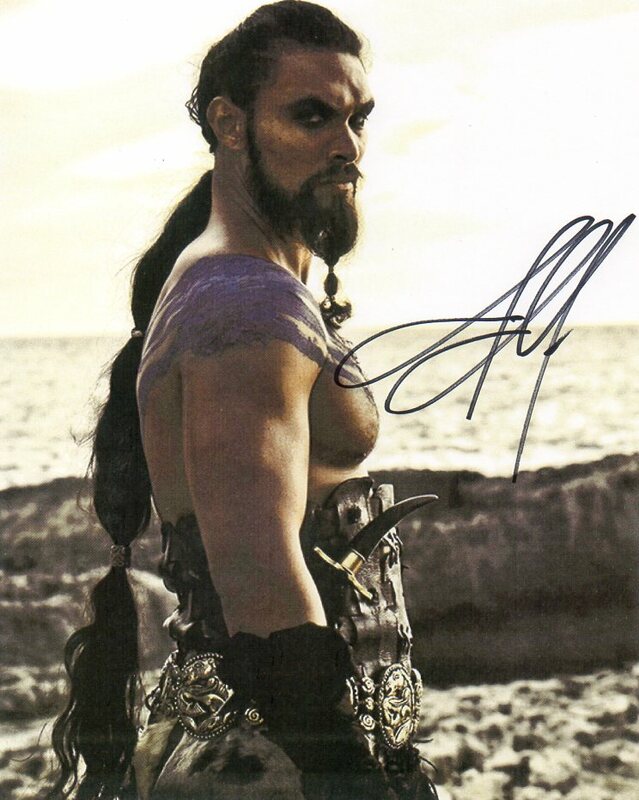 Sometimes, like with my Jason Momoa, he signed the pic BUT not the one I sent. (I am not complaining, though. 😉 ) And if you wonder if the signature is real or if the assistant did it, you can always compare to what other people got. (This is another feature we love about Startiger. We’ve-LUCKILY-had no issues like that so far). Oh Dexter, how do I love thee? Let me count the ways. Micheal C. Hall. Extra pumped to get this one! 6- Be Patient. Sometimes it can take a long time to get a response. We have gotten them as quickly as three weeks. And as long as five months. One person Mr. C talked to waited TWO YEARS before they got an autograph. But hey, least they got it! If you don’t join a site where you can keep track, write down your incoming/outgoing dates and info in a journal or on a device. 7-Have Fun. This is a hobby, one that you should relax and have fun with. Sitting down to write the letter is fun, but when you go to your mailbox to see an envelope with your writing on it: priceless! More then once I have called Mr. C from my car, giddy and screaming “Guess WHO I just got in the mail? !” We each have our own scrapbooks in which we keep our collection. And we enjoy hauling it out to show other geeks and fangirls and boys. It is a hobby that isn’t for everyone, but we sure love and enjoy it. Tim. Freaking. Burton. Need I say more? So, if you decide to give fan mail a shot, let me know how it goes for you!!! I would love to hear about it! 🙂 Are you someone who already writes fan mail? What are your fave successes? And who would you like to write to??? If I missed anything, feel free to ask a question! A month of letters officially starts for me today! YAY! 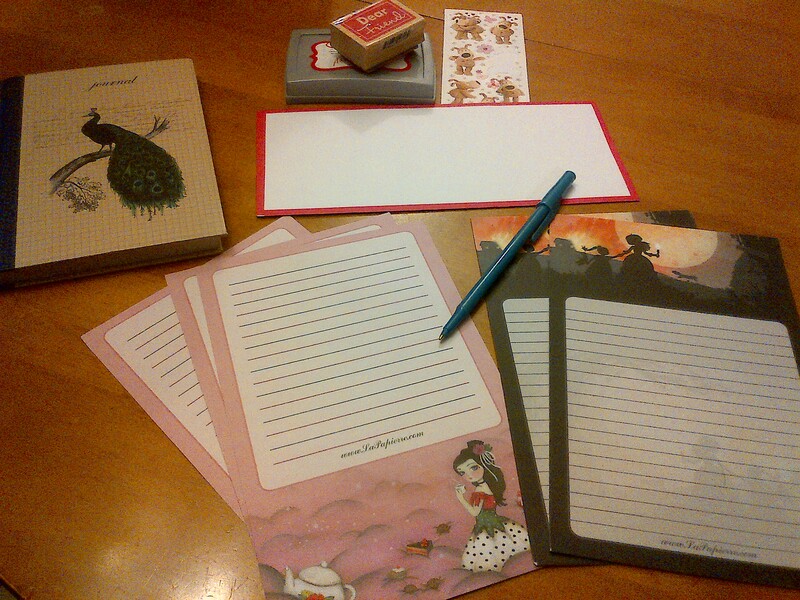 For those of you who don’t know, I am going to write at least one piece of happy mail each day this month. This morning I sat to write a letter to Shannon B., as well as make up an envelope for my niece. She collects postcards, and since I have a huge collection, every so often I send her a few. She’s also making my wedding programs, so I sent her a few things in regards to what I want on them. 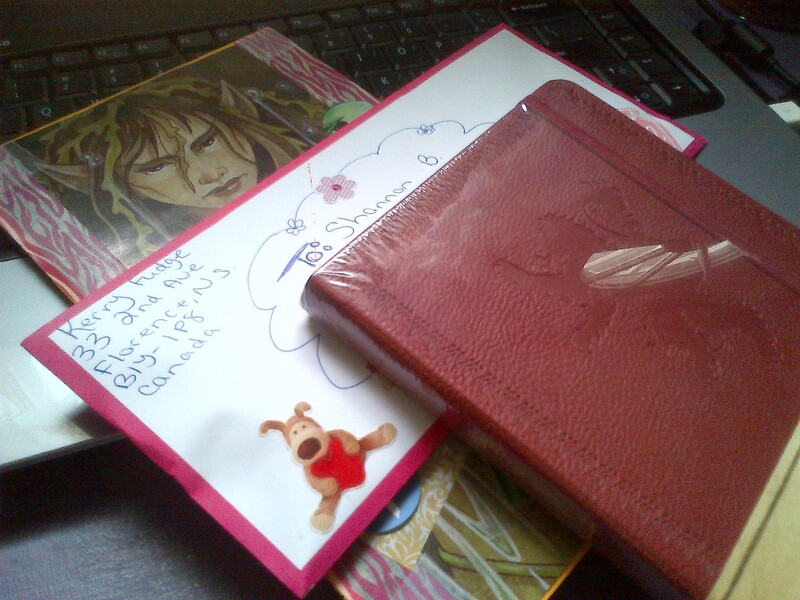 My stationary I bought from Lapapierre on Etsy, my address book, stamper and stickers for my envelope. I was pretty stoked writing this letter. After the blah winter we have been having, it feels good getting back into the groove of things. The envelope for my niece and my finished letter. Oh, and my new Game of Thrones journal. I had nothing at hand to cover the address, so it gave me an excuse to throw that in there 😉 I can’t wait to start filling its pages! I had a slow incoming mail month in January. 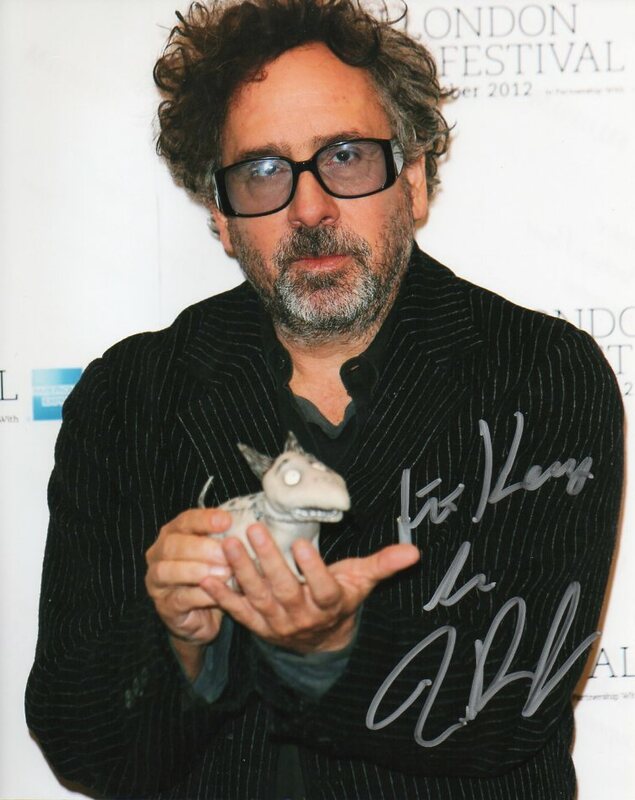 But one of those items was an autograph to add to my collection! 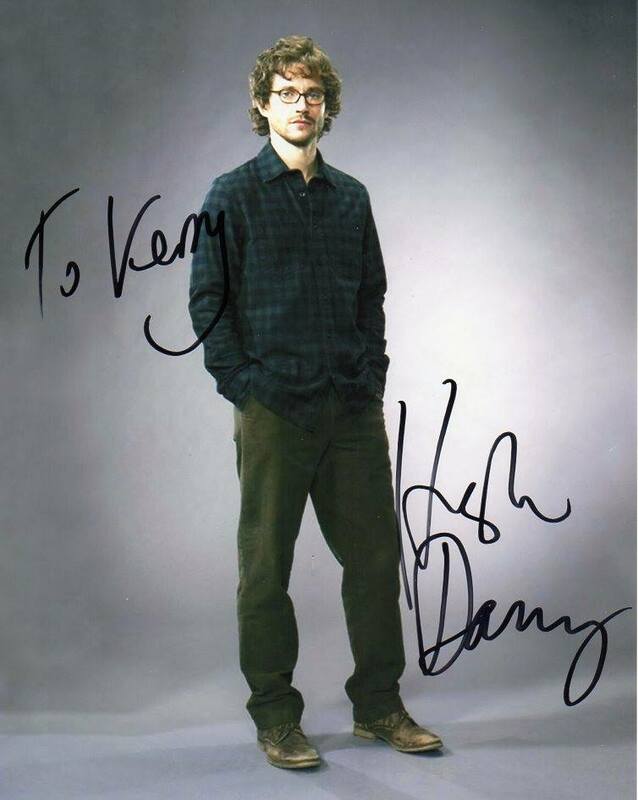 About three months ago I wrote to Hugh Dancy, who is currently on the TV show ‘Hannibal’. (Which is an awesome show! Didn’t think I would like it but ate up two seasons in about two weeks!) I was pretty excited to get this. And since I am a big bookworm, I can’t believe I forgot to post about this next autograph success! 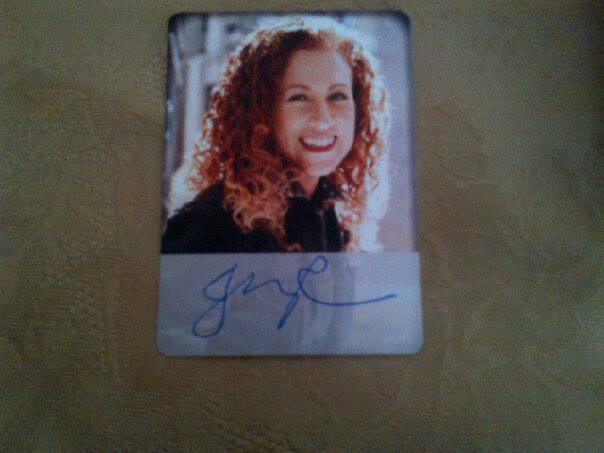 I got this autographed card back from one of my fave authors a couple of months ago. 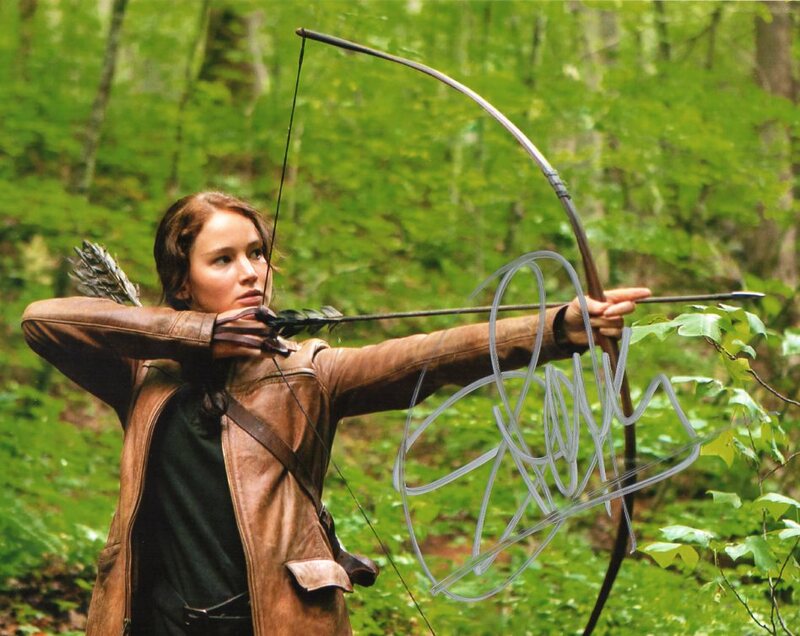 Since I am making a book themed Smashbook (more on that later), I will dedicate a page to her and add this autograph to it. Who else out there is doing Letter Writing Month? I hope everyone is having a great weekend!!! So last week I talked about my resolutions for the new year, and one of them was in regards to snail mail. I love opening my mail box and finding something that isn’t a bill or junk mail. I decided that February will be my month to have my Snail Mail Challenge, in which I will write a piece of mail every single day. Letter writing might be a dying art but it’s not dead yet! It will also allow me to get caught up (and stay caught up) on my personal letter pile. Sometimes I’ll write a short letter, sometimes it might be just a card and a note. I wanted to get my followers involved. Do you write letters? If so, care to join me in my happy mail quest? If not, would you like to get something in the mail that isn’t a bill? Here’s how!